Owning a small business can be just as rewarding as it is challenging. Let our five established RD experts help you determine whether it’s a practical option for you. Deciding to go into private practice is a big decision, and it may not be the right choice for every RD. Running your own business takes drive—and it often takes guts, too. 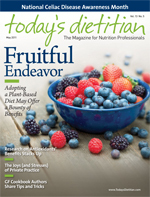 Today’s Dietitian spoke with five RDs who took the plunge to find out what inspired them, how they got started, what challenges they face, what keeps them going, and what advice they’d offer to others who may be considering the private practice route. Bonnie Giller says starting a private practice was something she always wanted to do, but she also knew she needed experience and a solid foundation. As a result, she worked in hospitals for a while and started her private practice as a side business, doing weight counseling. In the beginning, she ran the business out of her apartment. She says one key to success is the “P factor”— that is, professionalism. In the early days, she had an area of her apartment sectioned off for business and asked that her family stay clear when clients were there. Today, she applies that same professional approach to the full-time office she runs out of her home. The lower level was converted into an office, complete with a separate entrance, separate phone line, a waiting room, and a consultation room. Though she always makes time for her family, she says it’s important for her children not to run around her office area, which would take away from the P factor. According to Giller, one of the biggest challenges she faces in private practice involves insurance. In the early years, she wasn’t a provider, but she says with today’s economy, you almost have to be to succeed. “The paperwork and everything that goes along with being a provider is time consuming and frustrating,” she says. To deal with this problem, Giller has a no-show and late-cancellation policy. She asks clients to cancel within 24 hours and has them sign a form agreeing to this policy. Giller says she often allows clients some flexibility, as there are situations in which a person needs to cancel for a legitimate reason. But if clients make a habit of not showing up, she won’t book future appointments for them. “They’re not a client I want … if they don’t recognize the lost time or money they cost me from continually canceling,” she says. Sloan says when she started in the field in the late 1970s, dietitians didn’t have many options other than working in a hospital. “However, I quickly found out I wasn’t really cut out to work in a hospital when I almost passed out in the dialysis room. So I eased into private practice, first doing some work with a psychologist in a private setting who was working with eating disorder patients,” she explains. However, for Sloan, treating eating disorders requires corresponding with other practitioners, which she has found helps keep her engaged. About three years ago, she moved her office of 17 years into a setting where three therapists who also treat eating disorders have office space, which they rent from Sloan. Maggie McHugh started out doing clinical nutrition in a hospital setting before jumping into private practice. She calls this her “knowledgeable foundation.” McHugh comes from a family of business owners and always knew she would one day run her own company. In the beginning, McHugh was working for her employer—at that time, it was a community position as the nutrition program director at Cornell Cooperative Extension—raising a baby, and launching her business on the side. That meant she had to work nights and weekends, and she learned a lot during that time. McHugh says she recommends that anyone looking to start a private practice be financially prepared. She advises at least six months of savings be set aside for the business—more if possible. Health insurance ends up being a huge business expense, and she says she considers it one of the biggest drawbacks. But there are many pluses, too. McHugh enjoys having the freedom to explore her own creativity in her business and setting a work schedule that coincides best with her family life. She says that a private practice also requires a lot of patience. “Timing is everything,” she notes. Before launching her private practice, Beverly Kindblade had been a nutrition professor for about 12 years and, prior to that, an inpatient clinical nutritionist. While she had a lot of experience, Kindblade says she entered the private practice world without a single patient. A lot of hard work has helped her build a thriving business. Kindblade says her best advice to RDs considering the leap would be to get a website up and running at least six months to a year before even starting the practice. She says it’s the best way to advertise and get your name out there. It can help you build a client base so that you can “open shop” with some patients already lined up. Another lesson Kindblade learned is to have all your systems in place before the business grows too much. Kindblade’s business grew rapidly, going from just one or two patients per week in the first year to about 18 in year two and ultimately 24 to 30 per week. If you don’t feel totally confident doing all the business tasks on your own, hire a CPA and a bookkeeper, Kindblade advises. An IT person to manage the website may also be necessary. Kristin Reisinger took a bit of a different path since she became an RD after building a practice. She began her graduate studies in nutrition to become an RD and enhance an already successful personal training business. Reisinger says becoming an RD has only helped grow her business by benefiting clients even more. “My original goal was always to have my own business that would help people transform their bodies through fitness and proper nutrition,” she says. Though Reisinger already had a successful practice, she says she still held some part-time inpatient and outpatient clinical positions to gain more knowledge and experience in the dietetics field. She believes those experiences helped improve her private practice. Reisinger considers growing a client base to be one of the biggest challenges of owning a private practice. She says doing some free work for the purpose of getting your name out there and becoming recognized can pay off—but you still have to make money. Like other private practice owners, she says other big challenges include paying out of pocket for health insurance, not getting paid time off, and dealing with slow times of the year when a paycheck might not be as steady. However, she says planning ahead and being organized can help you overcome these challenges. And she says the freedom of owning a business is a huge benefit.